It has been a couple of weeks since our shakedown cruise. What did I take away from this? What would I do differently next time and what was a succes? Time to look back and reflect in this bullet list-style post. Items I need during cooking should NOT be stored in the locker above the stove. 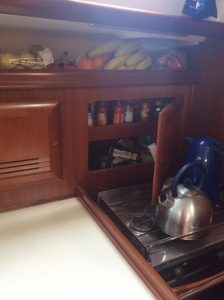 When we started out I had food items and spices in the locker above the stove. I thought it made perfect sense to keep them there UNTIL I wanted to make a meal and notice 2 things: 1. The door of the locker couldn’t open with pots on the stove and 2. Reaching over the flames was hot and dangerous! So I rearranged the lockers and put food and spices above the fridge instead. Much better. We need to add a hammock over the sink area to keep fruit and veggies in. We kept fruit and vegetables on top of the lockers but that meant some things were hard to reach and getting squished or bruised in some places. It also meant I completely forgot we had 2 bell peppers on board until I found them mouldy. Yuck. Keeping fresh items out of sight is not a very good idea, clearly. I was very glad I brought a hooded sweater on this trip, because it could get a lot colder than I anticipated, especially during night watches. I also wore sailing gear (a jacket and overall) but with nothing covering my head it got cold fast. And being comfortable on a night watch proved to be very important. In addition, although I never wear them at home, not even in winter, I might add a wool hat to my inventory so it doesn’t matter what sweater I am wearing. The anti-seasickness medication Superpep turned out to be just what I needed to battle seasickness. Superpep is a chewing gum. You take 3 pieces over a periode of 1,5 hours, getting a new piece every 30 minutes. The taste is a bit minty and a bit horrible, to be completely honest. It also contains something that “numbs” your mouth a bit. It took me a couple of uses to get adjusted to that feeling (it also means that if you want to eat or drink anything during those 1,5 hours it tastes… weird). But in the end I found it really did the trick for me. I noticed that I would be symptom free for about 5-6 hours after the initial 1,5 hour “chewing period” and I wouldn’t get sleepy from the medication (bonus!). I also noticed that the chewing gums were a bit “hard” so after the first day of using them, my jaw muscles hurt a bit, but feeling fit enough to go down below and actually do stuff has been a great payoff. I found nighttime sailing to be quite a magical experience. It took some courage from me to switch from using my eyes to look out for obstacles (boats, buoys) to trusting the AIS and radar equipment, but sitting outside in the dark with no sound other than rushing water and waves, the stars above us and lights in the distance was something I will never forget. Add to that my surprise when I noticed bioluminescent algae in the water next to and behind the boat! I knew it existed but I would have never thought to see that amazing phenomena on our first cruise. Even writing about this now makes me want to teleport back to that moment. Bliss. I also mentioned this in one of our videos but I found out (the hard way) that the shower drain in the forward head doesn’t work properly when sailing at an angle. This was a bit of a “duh” moment for me because I should have known that. And I also shouldn’t bring a new pair of jeans on the boat again because the water in the bucket I washed them in turned blue. Which meant the shower floor was filled with blue dyed water that wouldn’t drain away and I had to clean up by hand…. Stating on camera you will film something later (like dolphins for example) will automatically reduce the chance of said thing happening to zero. Sigh. Also camera-related: I noticed that my pronunciation and sometimes even grammar in English leaves a lot to be desired, especially when switching from Dutch to English in a moments notice or when feeling self-conscious about speaking to a camera. I really need to practice speaking more and I’m confident I will improve with time. But I definitely did have at least a couple of “cringe” moments while editing our videos. Yikes. Plans really are flexible. It is not that I didn’t know this already but our shakedown cruise proved this point once again. We ended up skipping Barbate in Spain and sailing to Gibraltar from Faro in one go because our speed was higher than anticipated, conditions were great still but about to change and we were all feeling good to keep going. If we had gone into Barbate it would have meant sailing to Gibraltar the next day with heavy winds and heavy rain. I’m so glad we didn’t. Our logbook needs an additional column to write down the current SOG (speed over ground). It’s something I feel the need to track and the pages do not provide for that. I’ll add that when we are on board next time. Last one: the kids adjusted so fast to life aboard. If they were ever bored it had to be just in the first day or two. On passage they were engaged in fantasy play for hours on end, using Playmobil, pencils and paper, or pretty much anything they could find aboard, creating elaborate storylines together. Robin even hosted her own quiz show one night, asking Jan-Paul, Rene and myself multiple choice questions she had written down about her collection of shells and stones she had acquired on the beach in Faro!